President Donald Trump's ostensible reversal on separating immigrant children from their parents did little to satisfy Gov. Jay Inslee and other state Democratic elected officials. OLYMPIA — President Donald Trump’s ostensible reversal on separating immigrant children from their parents did little to satisfy Gov. Jay Inslee and other state Democratic elected officials. 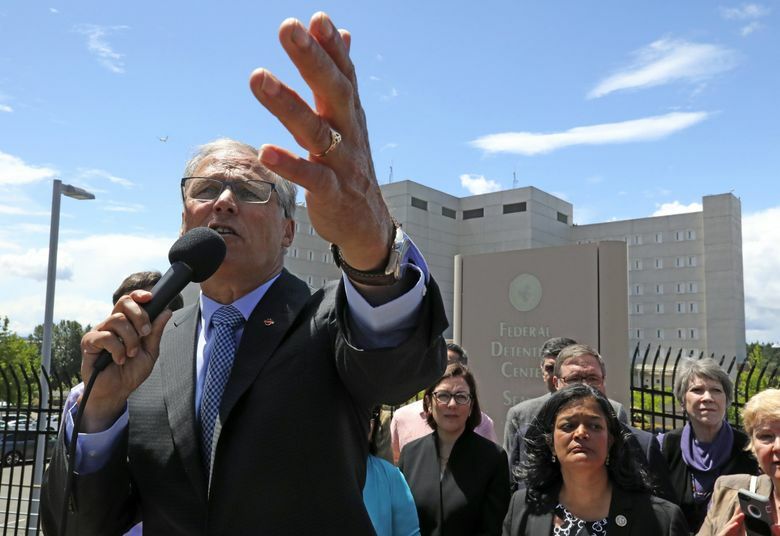 Inslee condemned the White House as a “den of deceit” at a news conference to announce more legal aid money for immigrants — scheduled before Trump signed an executive order rolling back the family separation policy. Trump’s reversal came after weeks of backlash, including from some Republicans. Washington’s four GOP U.S. House members this week joined all the state’s Democratic delegation in decrying the policy, which had emerged as part of the Trump administration’s “zero tolerance” crackdown on illegal border crossings. By contrast, the comparatively muted public statements from Washington’s GOP congressional delegation this week largely avoided direct criticism of Trump and his repeated false assertions that the separations were required by law. They echoed the president in tying the issue to broader immigration policy, including building a wall on the U.S.-Mexico border and changing the legal immigration system. After Trump’s order was signed, Rep. Dave Reichert, R-Auburn, said he hoped it will keep children with their families. “The President was wrong to take children from their loved ones and we cannot let it happen again. More changes are needed to ensure the system works as it should, and that is why Congress must enact broader reform of our immigration system,” he said in a statement Wednesday afternoon. Rep. Pramila Jayapal, D-Seattle, criticized Trump’s order, saying it would result in indefinite detention of whole families in “cruel and inhumane” internment camps. “President Trump knew he had to back off this cruelty — but instead of rescinding his cruel policy, he simply traded one cruelty for another,” said Jayapal. Seattle Mayor Jenny Durkan traveled to Texas Wednesday for a protest of the separation policy planned with fellow mayors on Thursday. Federal officials still haven’t answered questions by the governor and Attorney General Bob Ferguson about families members that have been separated and held in Washington state, Inslee said at his news conference. The governor also said there are at least nine children in Washington that have been separated from their families. That is in addition to the scores of immigrant adults being held at a federal detention center in SeaTac. Citing privacy, the governor didn’t divulge more details about those children, other than to say he believes they “were brought into the state” after being separated. Inslee announced the authorization of $230,000 in emergency funding for the Northwest Immigrant Rights Project to give civil legal aid for people, families and unaccompanied minors. The state Legislature this year had already approved $1 million in grants for the program, so Inslee’s move will bring the total to over $1.2 million. More than 2,300 minors were separated from their families at the border from May 5 through June 9, according to the Department of Homeland Security.